Analyzing the single currencies, Cruscotto will help you choose the best pairs to trade. Simply take the currency or currencies that are stronger and match with those that are weaker. You can easily view that the stronger ones have green histograms and weaker ones are red. Also when the score is more or less of a limit (a sort of signal zone) the text label of the period becomes green/red accordingly. This is the signal or at least the first half. Now to be sure, you need another pair that in the same timeframe that gives the opposite signal, and you can enter a short/long trade on that pair. Depending on the time frame, you’ll have different targets ranging from a few pips to whatever works best on the time frame you are trading. It can be that easy. How To Trade With Cruscotto? You can trade the Cruscotto on it’s own, or (even better) integrate it into your trading system and it’ll help you in your trading decisions. The strength and weakness of two currencies, can easily help you understand the trend of a pair. From the long term to the short term. Remember… the trend is your friend and the best trends come when there’s divergence between two currencies, i.e. when one is strong and the other is weak. The Cruscotto algorithm works by analyzing price only. It doesn’t use any other indicator like moving averages, RSI; etc. So all the signals are in real time and not lagging as is the case with similar indicators. You’ll also get to notice how currencies are correlated. You’ll get to notice what it means to have a strong Yen, strong US Dollar or a strong Euro. You’ll be able to pick up interesting intermarket correlations with having Gold and Oil displayed, which can assist you in “predicting” the market. Cruscotto Is An All In One Indicator! Well, it is one indicator, but it comes in three different layouts: Horizontal, Vertical and Squared, to fit your setup and your screen resolution. If you are interested in the CruscottoFX you can buy them from here. CruscottoFX Indicators (MT4) + templates. The indicators work on every MT4 platform and can be applied to any timeframe. Cruscotto is fantastic, can’t wait for the new version!! That sounds great! Could you also consider adding in some of the indices too? Such as the YM & S&P. Maybe have a place where we could add some pairs or indices of our own choosing. Some of the MT4 platforms offer more than just the currency pairs and Cruscotto did have Gold & Oil on it which is very helpful due to correlations. Can't wait for it to roll out! My first version had that. I'll add the option to customize the GOLD/SILVER field with any symbol. this link to buy Cruscotto is not working, I just get a blank page. Cruscotto can't be bought only with Forex Bullet Proof, but the FBP pages seems not to work anymore. I'm working on a new version of Cruscotto that will be out in the next few weeks that you can buy it directly from here. Do you have any idea when the Cruscotto update version will come out. I can't realy use the curent version because of cpu usage. I would realy like to use it with the RoverNorthSystem. May the univers bless you my friend. is there a way to use Cruscotto v1 on Gallant's mt4 platform? I’m working on a version running with brokers using suffixes. It should be ready soon. Have you been able to complete the new version yet? Working on it. I’ll release before the end of September along with many other indicators I’m working actually. did you finish new version. i use this everyday, my fav indi. The new version is even more “powerful” and easy to trade. I’ll post about it when it’ll be available for everyone. P.S. It’ll also work with brokers using prefix/postfix for symbol names. do you have a eta on new version. if you need a beta tester. pick me. The indicator is ready. Just testing it. And I also coded and EA based on it that is trading now. Now I’m refining the strategy. I’m also working on a web version of it so that even without MT4 you can have its signals. I use Cruscotto all the time, but it does take a toll on the CPU. Is it possible to get an email when you have the new version ready? About the “Price speed and acceleration” indicator and spotting divergencies: I find the “Composite Index” indicator (an advanced version of the RSI) is especially clear and helpful. I use it without its MA’s but together with the Stochastics indicator. I think it is free and maybe it could be beneficial to your customers, if you made it available. Something else that I find very helpful, is a simple script for MT4, that draws dotted lines for every 10 pips, or whatever I choose. It helps me evaluate quickly how much the single currency pairs moves and how big the stoploss will be. I got this script from a private trading group, but maybe you would find it something worth developing and making available!? thanks for the info. I’ll try them all out to understand how they works and if they can be interesting to be published. 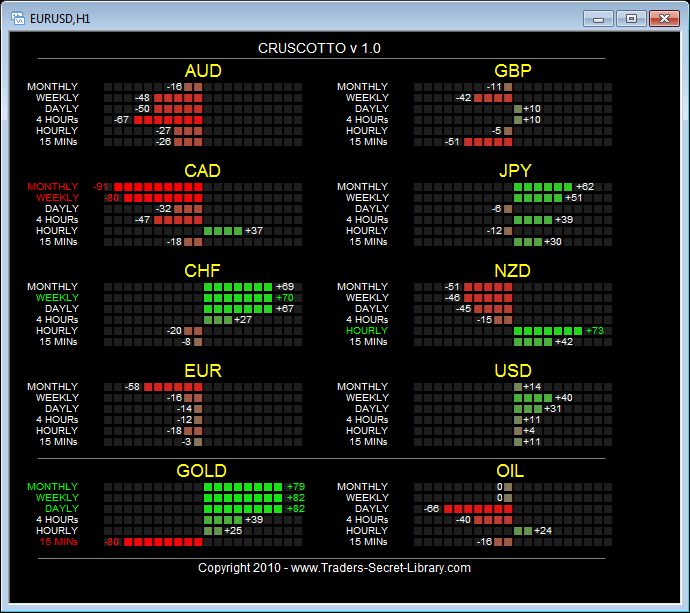 can you tell me how traders will know when the new Cruscotto indi will be released. threw emails or just keep checking in to website. also how much longer will you beta test indi. when it’ll be ready you’ll receive an email and also a blog post will be published. It shouldn’t take long for it to be ready. do you have any pics of the new version of Cruscotto. hope it will be released soon. In a couple of week it’ll be released in every possible format. Can tell you more but I’m working almost full time on it. I use Cruscotto v1.0 but I have a lot of problems with MT4 freeze. It only works if history is empty, but after day or two, when starting MT4 with Cruscotto chart – MT freezes. Forever… I left it more that few hours. Nothing. Any idea? Thx for the freebie. Maybe one day I will get to have success with all these indicators. Currently still trying to dig myself out of a Reticolor setup that has plagued me for a year. so I write them down to have a certain history. Powerlines. They are also very great! Can you tell me the principle differences between Cruscotto and Potenza? Hi Hans, Cruscotto uses WPR (Williams Percent Range), while PotenzaFX and PowerbarsFX offer many different options for calculating strength/weakness of each currency: RSI, WPR, Stochastic, Bollinger Bands, MACD. What am I looking for when I set the period bar on cruscotto v 2.1 to lower setting, for example 1 bar? How is it different to the default period of 10 bars? Please explain. Thanks. Thanks for explaining this Paolo. May I know the currency pairs which Cruscotto used for the Indicators? All the possible 28 crosses possible with the 8 majors. At least all that are available from your Forex broker. I have version 1 of the cruscotto indicator. It freezes up my platform regularly. The only way I can get it to work it to delete all the history and start from scratch. Does it have something to do with the new MT4 file configuration? Does version 2 have the same problems? Hi Eddie, version 2 works fine on Build 745. Please send an email to support.